A series of fun stories using very simple synthetic phonic-based text. Synthetic phonic learning is the process of reading by sounding the individual sounds of a word and then blending them together to read the word as a whole. With fold out flaps to make the reading experience more interactive. Written in conjunction with an educational psychology expert. This is one of my son's favourite bedtime stories and it makes him laugh when Goose gets what she deserves after upsetting everyone. Although he doesn't read yet (aged 3) he loves books and is beginning to want to know what the words say thanks to these simple, funny books. A funny and lively book which he enjoys again and again. 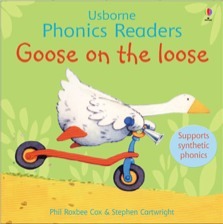 Find out more about synthetic phonics in the parent’s area of the Usborne Very First Reading website.